The journey to transform Stirling into a Gigabit City will take its next steps when next generation full fibre cables are laid in Cambusbarron this week. 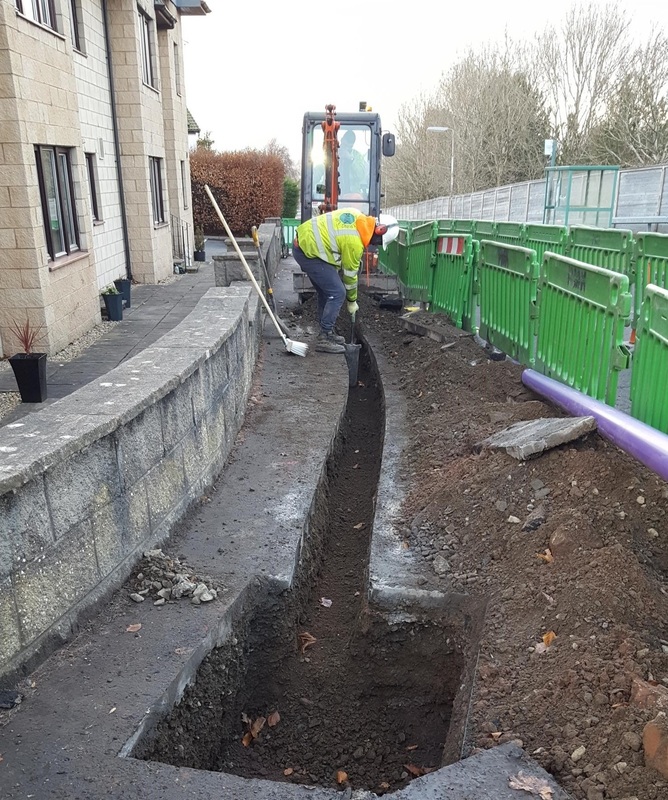 Construction of the full fibre network which provides gigabit speed broadband to the home started across Stirling in November last year to create a fit-for-purpose and future-proof digital infrastructure that will provide wide-ranging benefits to the entire community for years to come. The latest phase will see works take place in Cambusbarron and will involve the temporary, phased closure of Main Street between Tuesday 8 January and Wednesday 30 January 2019. Council-subsidised C11 and C12 bus services will be making detours during the work, with information detailing alternative routes posted on bus stops, on the buses themselves and available online at the Stirling Council website. From Tuesday 8 January to Thursday 17 January 2019, Main Street will be closed between its junctions with Mill Hill and Murray Place. Buses will not serve Mill Hill, The Brae, North End, Stewart Street, Birkhill Road and Park Place during the day, but will serve them in the evening. The Gillies Hill loop will be served in the daytime, but not in the evening. On Friday 18 and Saturday 19 January 2019 Main Street will be open and buses will operate normally. From Monday 21 January to Wednesday 30 January 2019, Main Street, Cambusbarron will also be closed between its junctions with Murray Place and Birkhill Road. Information on bus service diversions will be available nearer the time. Leader of Stirling Council, Cllr Scott Farmer said: “This is an exciting time for Stirling as we change the infrastructure of the city to become one of only four places across Scotland with access to Gigabit broadband. “The installation of these new services will open up a world of opportunities for Stirling but you can’t make such fundamental changes without incurring some disruption to normal services. “I appreciate the community’s concerns here and share their frustrations on how these works will impact daily life. Thankfully the diversions are only temporary and our Public Transport team have been out speaking to residents who use the affected services to help spread the message. “There will be more information in the coming weeks and months and we are working with CityFibre to improve communications and engagement with our communities as Fibre to the Home construction continues throughout Stirling. CityFibre City Development Manager, Elaine Doherty, said: “CityFibre is committed to transforming Stirling and Bridge of Allan’s digital connectivity and bringing gigabit speed full fibre broadband to almost every home and business. “We are investing £10m to help Stirling realise its potential as one of the first Gigabit Cities in the UK and are doing everything possible to minimise disruption to local residents as we roll out the new network.